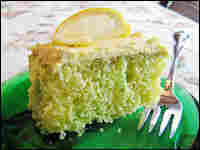 Reviving Lemon-Lime Icebox Cake After inheriting her grandmother's recipe box, April Fulton reveled in making one of her favorite childhood desserts: lemon-lime icebox cake. But she wanted to capture the cake's essence without resorting to commercial mixes. The author inherited her grandmother's recipe box. 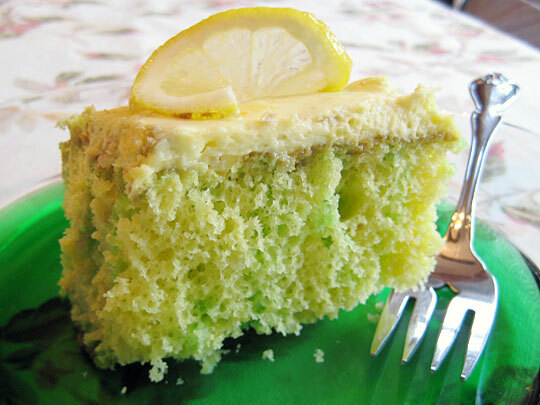 She has updated an old-school recipe for lemon-lime icebox cake. Recipes for two versions of lemon-lime icebox cake. April Fulton is a freelance writer in Washington, D.C., specializing in health care and food. Her freelance work appears in The Washington Post, Bethesda Magazine and Washington SmartCEO Magazine. Growing up the youngest of nine children during the Depression in rural Pennsylvania, my grandmother Virginia never took anything for granted. And she never threw anything away. After Grandma died last year at age 87, my mom tossed out hundreds of rubber bands, stacks of odd-sized envelopes and shoes Grandma hadn't worn in 20 years. But one item I kept: her battered tin recipe box. Among the fading recipes for dumplings, Swedish sausage and watermelon pickles, I found several recipes she clipped from newspapers, magazines and from the back of food packages. I even found a recipe for American chop suey that was sent in the mail with the gas bill. My favorites are the stash of recipes Grandma kept for the Jell-O desserts and salads that punctuated my own childhood memories with their sweet and odd flavor combinations. While a salad of orange gelatin and shredded carrots served over iceberg lettuce and topped with a dollop of mayonnaise may seem quaint today, it was cutting-edge food in mid-century America. One Jell-O-based recipe I found in Grandma's box brings back memories of my youth of picnics and family gatherings, where Grandma was often in charge of the dessert: lemon-lime icebox cake. Grandma must have liked it, too, because there are four copies in her box. The special chilled cake was served straight from the icebox, an insulated chest that held ice and predated the refrigerator. The cake has vibrant colors, a long shelf-life and inexpensive ingredients. This magic combination appealed to the practical and thrifty Lutheran women of northwestern Pennsylvania. I remember barreling indoors on hot summer days as a child, still dripping from the sprinkler, and watching my grandmother make the lemon-lime icebox cake (though she now had a refrigerator). She carefully smoothed her ruffly apron, bent over the stove and poked holes into a still-warm lemon cake while she told us stories. Then she steadily poured unset lime Jell-O into the holes so that when the cake was chilled and later cut, it would sport bright green stripes in every piece. She frosted it with a combination of instant whipped topping and lemon pudding mix. The hard part was waiting until it was cold. The cake went back into the fridge for at least a few hours to set, or sometimes into the freezer for up to a month to be taken out later for a church supper or a family birthday. My sisters and I would jockey for the piece with the most electric green slashes, sitting around the kitchen table, listening to how Grandma's sisters stuffed her in a suitcase, her romance with her high school sweetheart — my grandfather — and most amusing to us, tales of my mother's childhood antics, like the time she wanted to run away but cried because she couldn't cross the street alone. Jell-O has been around since the turn of the last century, but it really caught on during World War II as a substitute for pricier side dishes and desserts. It continued to entice home cooks through the decades with its rainbow of colors, its ability to take on the shapes of any mold and its distinctive wiggle. As Americans have gone back to fresher, more natural foods, Jell-O has lost its caché. However, there are still diehard fans. There's even a museum dedicated to Jell-O in its hometown of LeRoy, N.Y. I recently made my grandmother's icebox cake, although I hadn't made anything with Jell-O for years. It tasted just like I remembered: cool and summery and very, very sweet. But I wondered how I could capture the essence of the cake with fresher ingredients and without resorting to commercial mixes. After some experiments with a sponge cake that was too light to keep the curd from spreading out and some ethereal-but-impractical whipped cream-based frostings that didn't hold up in the fridge, I settled on replacing the lemon cake mix with a sturdy lemon butter cake, the lime Jell-O with lime (or lemon) curd, and the whipped topping and pudding mix for mascarpone with lemon zest. As summer fades, I love to make this cake and imagine I'm sitting with Grandma at the kitchen table. I can almost hear her stories and see her wink as she wraps up the remnants of the cake for dessert another day. This recipe is adapted from The Simple Art of Perfect Baking by Flo Braker (Houghton Mifflin 1992). Start with all ingredients measured out and at room temperature. Preheat oven to 325 degrees. Butter a 9-by-13-2-inch baking pan. Sift cake flour, baking powder and salt into a bowl. Set aside. In an electric mixer, beat butter and sugar until fluffy, scraping down sides of the bowl periodically. Add beaten eggs slowly and continue beating until thick and double in volume. Remove bowl from mixer and carefully fold in one-quarter of the flour mixture with a spatula. Then fold in one-third of the milk. Repeat the folding of the flour and milk alternately, ending with the flour. Last, mix in the lemon juice and zest. Bake in center of oven until top is set and springs back to the touch. Check after 30 minutes. Remove from oven and let rest about 15 minutes. To make the curd the color of lime gelatin and create the right contrast for the striped cake effect, you will have to add a drop or two of green food coloring. But the flavor of real fruit — as opposed to Jell-O — is worth the effort. Mix curd and food coloring, if using. Thin slightly with a few drops of warm water until the curd runs in a not-quite-steady stream from a spoon. It should be the consistency of a very soft pudding or unset gelatin. If it's too runny, it won't stay in the holes, so add a tablespoon more of curd from the jar and stir like crazy. If it's too thick, it won't go down the holes and you should add a bit more water. More sophisticated and tangy than whipped topping, but unfussy at the same time, mascarpone, right out of the tub, is the right texture for spreading on almost anything. Stir all ingredients in a small bowl and set aside. After the cake has cooled for about 15 minutes, poke holes in it with a straw at about 1-inch intervals, removing any cake clinging to the inside of the straw. If the straw begins to bend, snip off the bottom and keep going. Carefully spoon the filling into the holes with an ordinary teaspoon. If it comes out of the holes, don't worry. The topping will cover it up. You may need to go over the holes twice if they don't fill up the first time. Spread the mascarpone topping thickly over the cake while still warm, cover loosely with plastic wrap and put the whole thing in the refrigerator for at least two hours or until cold. Serve slightly chilled or at room temperature, decorating each piece with candied lemon peels, if you like. Store in refrigerator wrapped tightly for up to 2 weeks. I don't recommend freezing it after frosting because the mascarpone loses its texture in the thawing process. The original recipe my grandmother clipped may have been created by Duncan Hines in the 1950s because it called for a Duncan Hines Lemon Supreme Cake Mix, although a spokeswoman for the company said she could find no record of it. Dissolve gelatin in 3/4 cup boiling water. Add 1/2 cup cold water and set aside. Mix and bake cake as directed in a 9-by-13-by-2-inch pan. Cool cake 20 to 25 minutes. Poke holes through top of warm cake (still in pan) with a drinking straw. Space holes about 1 inch apart. With a measuring cup with a spout, slowly pour gelatin mixture into holes. Refrigerate cake while preparing topping. In a chilled, deep bowl, mix either by hand or in a mixer the whipped topping mix, instant pudding and cold milk until stiff, 3 to 8 minutes. If using Cool Whip topping, mix in a blender with the instant lemon pudding mix and omit the milk. Mix well, about 5 minutes, scraping down sides of the bowl so the pudding mix is well incorporated. Immediately frost cake and store in refrigerator at least four hours. Cake is best served chilled. Frosted cake may be frozen for a month or refrigerated for up to 2 weeks.